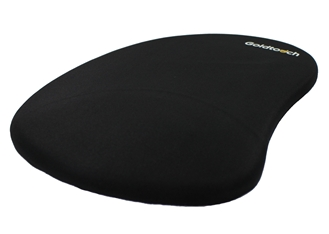 The unique design of the right handed Goldtouch Mouse Pad allows users to mouse in greater comfort. The right handed mouse pad is uniquely designed to better protect your hand and wrist from hard surfaces and ensure that you're in maximum mousing comfort. The platform is made of dual textured stress-dispersing gel, with a black Lycra cover providing excellent track-ability. The SlimLine Mouse Pad is great for people using today’s thinner or mini keyboards, as it helps maintain a consistent product height and the overall flow of your workspace.